Homefire is the market leading smokeless coal for use on open fires and multi-fuel stoves. It lasts up to 40% longer than house coal, and produces up to 80% less smoke. Homefire also generates up to 30% more heat than house coal, so you can use less to achieve the same heat output. 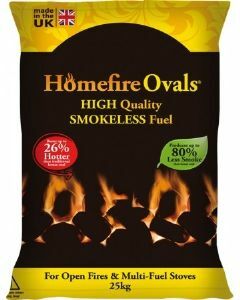 When you burn Homefire smokeless fuel, you'll spend less time worrying about refuelling, and more time enjoying the fire. Slow burning, and easy to control, Homefire burns with an attractive and natural flame.